The Dow Jones rallied as much as 209 points intraday to 11625, as European leaders provided a road map to tame the debt crisis, the Fed said it discussed further asset purchases and strong earnings by PEPSICO. However, the enthusiasm waned in the midst of current 3Q11 reporting season after a poor showing by Alcoa, with the Dow Jones losing more than half of its gains to close 103 points at 11519. Other key companies slated to report their 3Q results this week are JP Morgan and Google (tonight). Technically, after breaking the downtrend line resistance of 11144 (near mid Bollinger band), the Dow is trending nicely towards upper Bollinger band of 11670. SMA) and 11969 (200-d SMA). 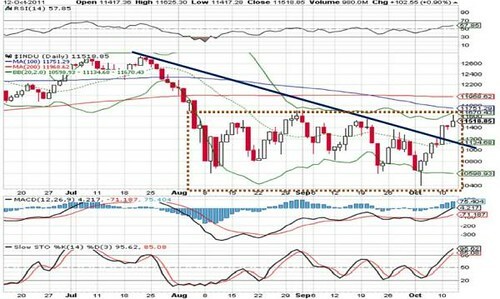 Near term supports are situated near 11135 and 11203 (50-d SMA).